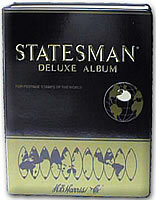 The Statesman Album has been expanded and now divided in 2 volumes. Each volume has more than 16,000 illustrations and has space for more than 18,000 stamps each. Contains extensive geographical, historical and demographic data for each country, plus a Vanished Lands section. Country issuance varies. Volume II includes countries Macao to Zimbabwe.